Those who follow SUPM regularly will know of our land paddling love. For times when on water conditions aren’t really playing ball and you really want to get some sweeping practice in land paddle antics fit the bill perfectly. 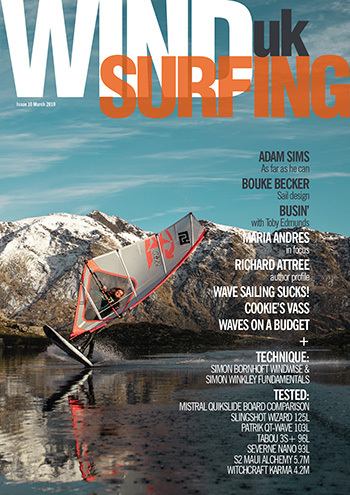 A way to keep your paddle fitness going and in some instances improves your technique – developing muscle memory for SUP surfing is doable whilst land paddling for instance. Hammerhead Boarding Products’ Ocean Blue has been on SUPM’s radar for a few years now – in fact, all the brand’s gear has. It’s only been of late we’ve had opportunity to test the unique, patented design. (The unique shape is so riders don’t catch wheels during carves, which definitely works). 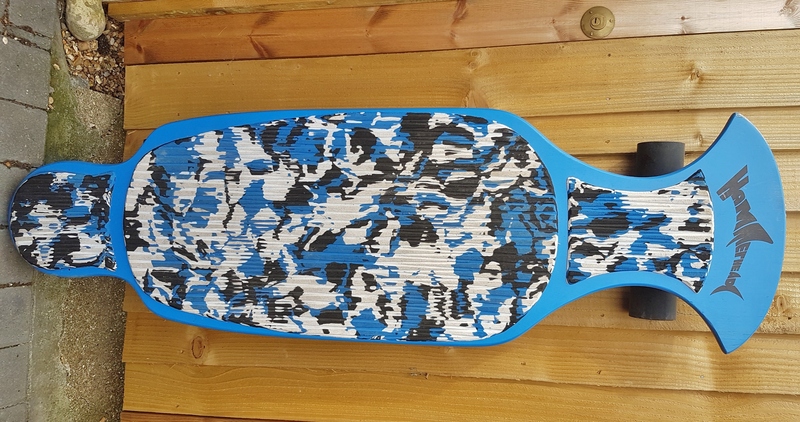 Coming in striking blue with soft camo deck pad the Ocean Blue is very akin to a Hammerhead Shark – the clue’s in the name. 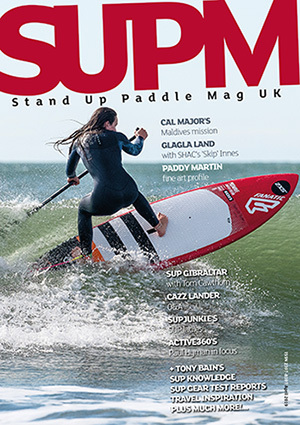 Designed to give all riders a unique on land SUP experience it’s a performance paddle skate that’s ready to rip tarmac! Stepping aboard and everyone from newb land sweepers to seasoned pros will find it a stable platform. Our newest tester, Tony, was a little sceptical about land paddling and conscious of falling and hitting terra firma. Yet within moments his confidence had increased and his words later were: ‘it’s actually quite a laugh’. This should reassure anyone not 100% about SUPing tarmac. Land paddle boards by their very nature aren’t just skateboards – they’re configured differently. As such Hammerhead’s Ocean Blue reacts to positive paddle strokes and once riders build momentum the roll just keeps on, er, rolling. Over distance that squidgy deck pad comes in to its own as bumps and lumps are ironed out making it a super smooth glide. On the flipside it does slightly deaden the board’s feel. 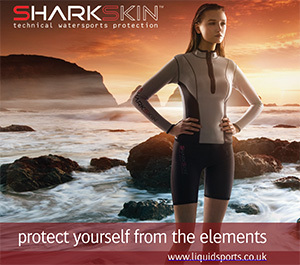 More aggressive skaters may prefer to remove the padding although that would somewhat affect the aesthetic. Slides are possible and the included Hammerhead three piece adjustable paddle is comfortable, efficient and easy for rail to rail changes or simply cruising along. It’s nice the paddle has been given thought and not just bunged in as part of the package. There’s also a nifty option of moving trucks back and forth to tune the feel of the Ocean Blue, which we readily salute. Hammerhead Boarding Products’ Ocean Blue land paddle board is a visually pleasing sled that should appeal to many. Whether you enjoy revving along on the flat or carving a few arcs it’s a tool that works as SUP cross trainer or stand alone paddle toy in equal measure. The included paddle is great and we could see the Hammerhead slotting into our toy box pretty easily. A unique shape with plenty of agility for SUP surfers looking to rip it’s as mellow or performance a ride as you want.